Yesterday I did my longest and toughest run ever, the Ron Herzog 50K (which ended up being around 32 miles, a little more than 50K). I stumbled upon it a week ago while looking for trail runs online and decided to give it a shot. This is a small race and when I showed up it seemed like a lot of the participants knew each other. I think around 50 people were there. The race FREE….with suggested $25 donation to support the ALS association in honor of Ron Herzog, an ultra runner who died of the disease. The course was 90% on old logging roads. What was the other 10% on? I’ll get to that! 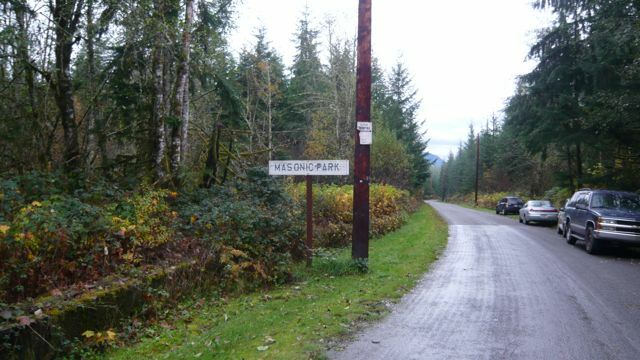 For the first few miles the logging road was covered with pretty hefty gravel and good-sized rocks and then the road became mostly dirt with some small gravel in spots and climbed steadily for about 8 miles to about the 10 mile point. Yes, that 8 miles of climbing! Occasionally the road would flatten and even go downhill for while, but the overall trend for the first 10 miles was mostly uphill. I am not certain on the elevation gain, but I overheard one of the runners around mile 7 mention that the start was at 600 feet, and that we were at 1800 feet around then….so I’d estimate the high point was around 2,500ft or so. This is a total guess so if you are reading this and know the actual elevation – please leave a comment and let me know. I’m also guessing on the race distances….since I wasn’t wearing a GPS and the course was not marked with distances. At the 10 mile point we left the older logging road for a freshly cut logging road and climbed steadily for a while before entering a very thick forest. I mean really thick! 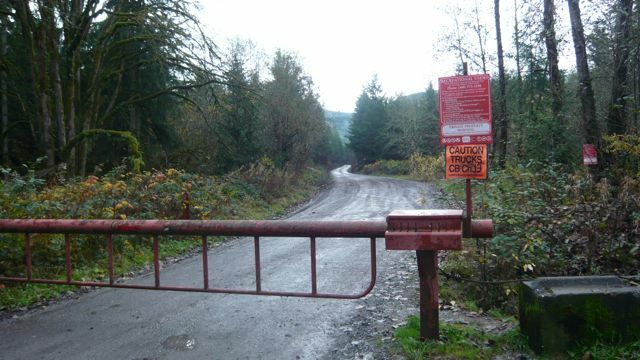 This is where the 10% of the course that isn’t on logging roads begin. In the course description they mention that the route covers several miles of “tank traps.” I had no idea what this meant when I signed up. Everyone was talking about them at the race start though. In fact they gave you an option of avoiding the tank traps through an “out and back” along the last half of the course (I’d day about 5 people did that). I am still pretty confused about what tank traps are, but I’ll describe to the best of my ability. They are series (perhaps a few dozen) of gully’s about 5-10 feet deep and 20 feet across (roughly) that were probably used at one point to test and train military tank operators (there is an army base nearby). However, this part of the course is up on a mountain and totally covered with dense wilderness. So I have no idea how a tank would make it up here. Thus the confusion. Anyway…I’ll continue with the story. The tank trap section of the course lasted for about 3 miles. The brush and woods were so thick I was constantly having to climb over trees and logs, and somehow navigate through this maze. Everything was super slick with rain and moss and grime. I slipped a bunch. My shins were ripped up a little from the brush. There was no real trail to follow, so I followed a series of pink ribbons that were tied around trees by the race director to make it through. Without those ribbons I would have been hopelessly lost for sure. There were small streams following at the bottom of each tank trap, which ensures that every part of clothing, including my shoes, would be drenched. The weather was pretty cool – around 45 degrees and light rain that kicked in around mile 6 and stayed through until around mile 26. I was soaked for most of the run, including my shoes and socks – and incredibly cold until the final few miles when the rain let up and I hit a second wind and was able to run faster. After the tank traps we has a small stream crossing (not too big a deal, I actually hopped from rock to rock and didn’t have to step into the stream at all) and continued another 3 miles until the first aid station. Yup, you heard me right, the first aid station was 16 miles in! I was lucky that I wore a fuel belt with 4 x 8oz water bottles and a couple of energy gels. However, even this was not nearly enough water or calories. More on this later. The aid station was awesome though, they had all kinds of food – including little boxes of Nerds candy (one of my favorites! ), jelly beans, dried fruit, PB&J sandwiches, Hammer Gel, HEED energy drink, water, etc. I was so hungry at this point I stuffed my face with dried fruit, loaded up my Fuel Belt with HEED and chugged a bunch of water. I filled my shorts pocket with boxed of Nerds and stuffed a handful of jelly beans into my jacket pocket. I also ate half a PB&J while I walked away from the aid station. That last part was a mistake. I’ll come back to that. The course continued on for another 8 miles with rolling terrain, trending slightly uphill the entire time. At mile 24 there was another aid station – but this time is was in the form of a few jugs of water left on the side of the road – self-serve! The next 5 miles were essentially trending downhill along a winding dirt road, eventually hitting pavement for a few miles flat stretch. At this point I saw the first signs of civilization, in the form of a log cabin home, and make a right turn onto a more highly traveled paved road. 2 and a half miles down this road we turned into the parking lot for the finish line. What a welcome sight! So that is the course in a nutshell….here’s more of a take based on how I felt during the race. I’ll start out by saying that I really had zero expectations going into it. I just wanted to finish with a smile on my face. I thought finishing in around 5 1/2 hours would be decent and very doable, but was ready to walk as much as need be. The starting line, just beyond this red gate. Gear and attire: I wore my Mizuno Waverider lightweight running shoes, Sole-brand running socks, and Lululemon shorts with a built-in liner. I wore a Lululemon Silverscent top and a North Face Hyvent water-proof and breathable lightweight running jacket. Under my jacket I had a Fuel Belt with 4 x 8oz bottles filled with water and 2 x Power Gels in the little pouch in the Fuel Belt. Mile 0: It was barely light out and cold. We’d start running before the sun had risen over the horizon. A minute before the race was going to begin, I ask the race director about the aid station at mile 8 (I read on the website there would be one there) – “there isn’t one” he replied…whoops! I quickly ran back to my car to grab two more 8oz bottles for my Fuel Belt…good call. Made it back right as we started. Mile 1: I start out jogging pretty slow. Learning from my Portland Marathon experience a month ago – I’m going to be super conservative this time. I’m probably doing 8-9 minute miles. Mile 2: I’m towards the back of the pack, but pass by a few people here and there. I keep my slow and steady pace, the road begins to climb and my heart rate climbs as well, but my pace stays the same. Miles 3-8: The road is steadily climbing uphill the entire time. I pass several folks on the uphills. I settle into a nice rhythm and have some conversation with a couple of guys around me. One ran the Leadville 100 ultra-marathon this year! Eventually these two guys pull ahead and I don’t go with them. Focus on just taking it easy. People are so friendly and talkative during this race! Welcome change from other races I’ve done. Miles 8-10: There is nobody ahead of me and nobody behind me. I feel very strong and steady. Regularly drinking water, and almost through my supply! So glad I ran to the car to grab the extra bottles. Mile 10: Am I lost? Where am I? Pretty sure I am on the right road, but there are a bunch of turn-offs and I’m not seeing any little pink ribbons (they are placed at turn points to tell us where to go). Eventually I see one and stop worrying as much. The scenery is beautiful, there is a fog covering everything and a light rain. The forest is full of tall pines and some Alders. The temperature drops as I continue climbing up this mountain. Miles 10-13: Tank Traps! I spend the next 40 minutes (I think, I didn’t wear a watch) navigating through several miles of steep mud-ridden gully’s, climbing over trees and branches and generally bushwhacking through. Four people pass me during this stretch. They are motoring through this stretch while I am barely walking through it. My shoes are slipping on everything (I wore lightweight street running shoes not trail shoes, another mistake). I go slow to limit the chance of injury. Mile 13: Stream crossing! Not a big deal. Glad to be out of the traps and running again. 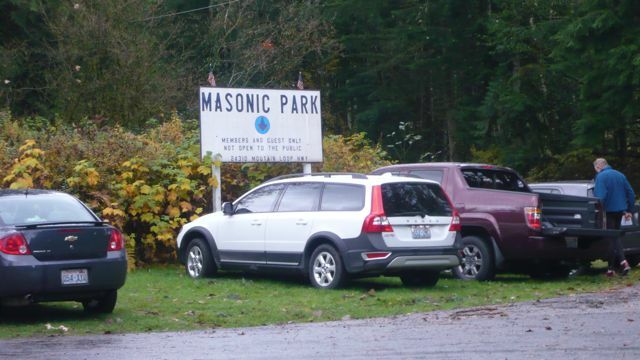 Miles 13-16: Re-pass a few folks and settle into a nice rhythm along this pretty flat logging road. I am super thirsty and hungry at this point. Getting very very cold. Mile 16: Arrive at the first aid station and stuff my face and pockets with a whole bunch of candy, grab half a PB&J sandwich, and some other food. See folks grabbing their drop bags and changing into new socks and dry shoes at this point. Good idea. I continue walking out of the aid station eating my PB&J. Miles 16-20: Alternate between slow jog and walking. At first I run for 3-4 minutes and walk for 30 seconds. Then I start running less and walking more. People continue passing me. The boxes holding the Nerds brand candy that were in my pocket start falling apart so I just eat them all! The PB&J is not settling well..or maybe it was the ton of Nerds I just ate? I should have just stuck to the energy gels. Anyway…I’m walking and focus on just moving forward. Miles 20-24: My legs stop working. My hands get really swollen as do my feet. The same thing happened at Portland Marathon last month. I am super cold so maybe that is it? Something I ate or didn’t eat? Who knows…even walking hurts. I start chatting with a couple older gentlemen who tell me to just keep walking and I’ll feel better and can start running when we hit the downhill. At this point I don’t think I’ll be running any more at all. My feet hurt like hell from the swelling. I reach into my coat pocket for some jelly beans and realize with all the rain they’ve turned into a soupy mess of sugar liquid. It ends up coating my hand so I lick my hands like a giant Popsicle. The things you will do when you are really really hungry! Mile 24: I hit another aid station…it’s really just a few bottles of water on the side of the road! I refill and continue walking. At this point I am well over four hours into the adventure….maybe close to five. Mile 25: We begin a long 5+ mile winding descent. My legs start feeling better and I alternate walking and running. Those older guys were right, my legs are working again! Woohoo! Miles 25-28: I start running more and more and walking less and less. I really do hit a second wind. The swelling in my hands and feet starts to go away. As we descend I get a little warmer and the rain lets up to a light drizzle. Miles 28-30: I am now running a lot faster – even faster than the beginning of the race. I stop to take a short walk break and another runner – Seth – catches me and asks if I want to run with him, I say sure and we continue running along and keep chatting. Miles 30-32: Seth and I make the final turn onto a paved road for the final few miles to the finish, we keep picking up the pace and do the last mile in < 7 minutes (I would guess)! Finish: Cross the finish line….little fanfare – no medal or time-chip map. Just someone with a stopwatch and a bunch of high fives from other runners. I like the low-key aspect of it all! My time – a whopping 6 hours and 40 minutes. I also realize that racing and ultra really isn’t about the time. Nobody was asking each other about their time. It’s as if nobody cared about that anyway. They were only asking if you “had a good time” as in “did you have fun?”. What a refreshing thing. Normally at a road race people get so caught up in how fast they run. Here, just finishing is all that matters. Time was pretty much irrelevant. All that mattered is how you did based on your own capability and expectations. I learned a lot through this race. I learned that no matter how bad things seem at the time – they will get better if you are able to tough it out. I learned that the mental aspect of endurance sports is really a massive factor. It’s all about not giving into little aches and pains and knowing that things will turn around if you give it time. I learned that being prepared – the right hydration, nutrition and gear is hugely important in long races. I was freezing for a lot of the race, short on water for the middle portion and didn’t eat enough early on. This meant I was walking more than I would have liked but eventually bounced back and finished with a smile on my face. 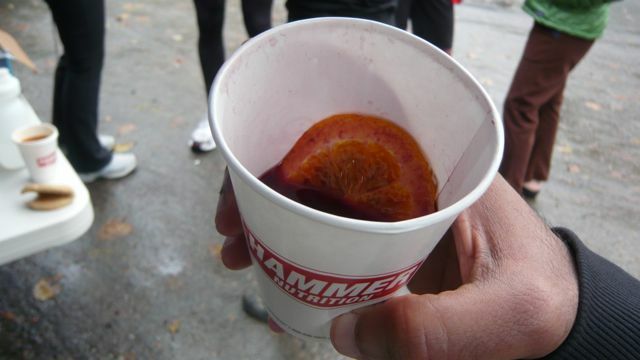 Hot spiced wine in a Hammer Nutrition cup...gotta love the irony. After the race everyone hung around chatting – and cheering on the final finishers (I was close to the end of the pack!). Many of the runners were veterans of countless 100 mile ultras, and they were all super nice and helpful. 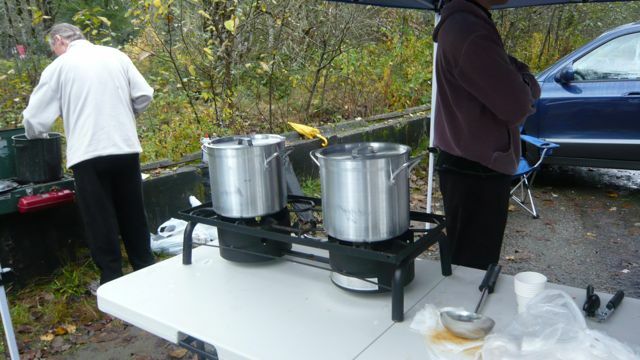 As per race tradition, all entrants brought a can of soup – which were mixed together into two massive pots of stew to be shared amongst the finishers (and yes – they had a veggie pot)! They also had a big pot of hot spiced wine which was incredibly tasty. Post-race stew...including a pot of veggie soup! I’m now a little more prepared – at least mentally – for my next ultra-marathon – the North Face Endurance 50K in San Francisco. I’ll be dialing in my gear and nutrition approach between now and then for sure. Bathrooms were everywhere...just step a few feet off the side of the road! I find it funny how once you accept that you’re going to run this 50K that your body just does it. Yes you feed it and water it but you are able to do it. I ran 14 miles Sunday with back spasms. I pulled a muscle in my back sneezing and it flared up, I couldn’t take a deep breath while I ran. After I was done the wife asked me why didn’t I quit. I told her because I wasn’t done with the 14 miles. This makes no sense to most people. I think that’s why we do things like this. It is the mental toughness you gain by achieving your goal. Wow, way to go! What is your next race? I’m doing the North Face Endurance 50K in SanFran next weekend. Thank you so much for continually sharing, encouraging, educating, and inspiring. Your posts are very much appreciated! 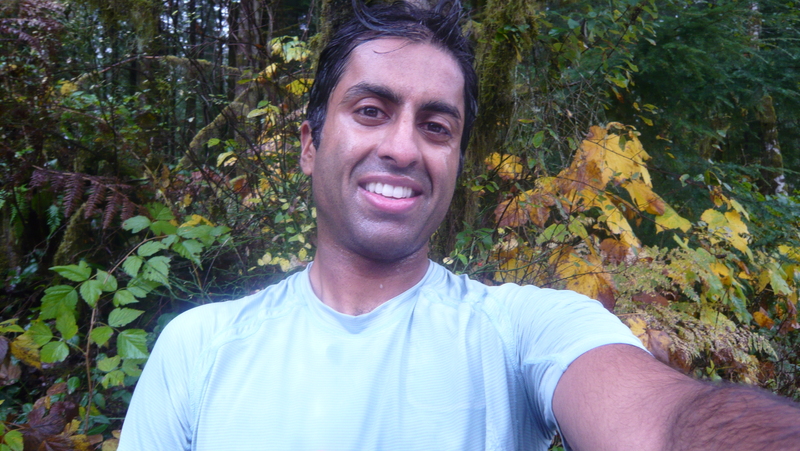 Hey Ravi – lots of fun to run the last few miles with you. Great writeup. I didn’t notice the wine was in Hammer cups. That is hilarious. Good luck in your NF 50k in SF if I don’t see you before then! Wow! Great writeup! Congrats on your finish!! wow! a big congratulations for doing this race. I am no where near doing something like this in my own personal fitness goals, but I was able to take a lot of the things you said and apply them to my own goals. as always, thanks for sharing and you are an inspiration!